Mir Khalil-ur-Rahman Sahib, one of the most enterprising entrepreneurs of Pakistan's newspaper industry did not make friends easily, but once he accepted you as a good friend, he nourished that friendship with the warmth of sincerity and consistency. This forte in his character won him the loyalty of many useful and important friends and in return he also gave them his support and fealty. Except Mir Sahib, no other newspaper publisher in Pakistan built up such a close friendly ties with the newspaper agents and hawkers as did Mir Sahib. In the early 1950s, Tahir was a leading newspaper agent in Karachi. He took pride in the fact that he was the leading seller of the Daily Jang in Karachi and that he had direct access to Mir Sahib. Once a federal minister in Karachi was holding a dinner party in honour of a visiting foreign delegation. Mir Sahib had already promised Tahir to attend the wedding of Tahir's daughter. Mir Sahib kept his promise to Tahir and attended the wedding in Tahir's family. Mir Sahib had a special regard for Jang's newspaper hawkers and in their hour of need, he helped them with loans and even spoke to officials in their favour. Mir Sahib showed loyalty to good friends. He recalled with gratitude the good work done for Jang by staffers in Delhi such as columnist Sabri. When he launched the daily Jang in Karachi, he imported many old staffers who had worked with him in the Jang in Delhi. Many achieved name and fame in Pakistan's journalistic world. In fact, many names now famous in Pakistan's media world owe their success in Pakistan to Mir Saheb's selection and encouragement. Talented columnist in the Jang, Ibrahim Jalees owed his induction into Pakistan's press world to Mir Saheb's eye for journalistic talent. Like an accomplished jeweler, he chiseled raw uncut diamonds and made many scintillating stars in Pakistani journalism's firmament. He had great respect and affection for the loyal members of his press team. Once a high official in Baluchistan picked up a quarrel on flimsy grounds with Jang's reporter in Quetta. He wanted Mir Sahib to sack that reporter. 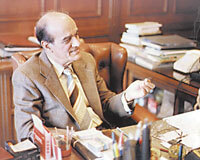 Mir Saheb did the inquiry promptly, found the reporter was not guilty and retained him in the Jang's service. Mir Saheb believed in defending his employee provided he was not at fault. He had a high sense of justice and fair play both in his private life and in the newspapers he fathered. Mir Khalil-ur-Rahman Saheb was a good friend of Faiz Ahmed Faiz and an admirer of his Urdu poetry. Mir Saheb developed a strong friendship with Faiz Saheb during the War-time years in Delhi where Faiz Saheb was an important functionary in the Public Relations Directorate that served the British Armed Forces based in India. Mir Saheb went to poetical gatherings in Delhi and the organisers were able to persuade Faiz Saheb to be their star poet in the soiree. Mir Saheb's Delhi Jang carried fulsome reports of the event. Faiz Saheb and his poetry got kudos in the Jang reports. When our delegation arrived in Canton from Hong Kong, our Chinese hosts, the All China Journalists Association discreetly suggested to us to select a Leader of the Delegation who would lead us at all official functions and in our formal meetings with the Chinese VIPs such as Chairman Mao and Prime Minister Chou-en-lai. A loyal friend, Mir Saheb proposed the name of Faiz Ahmed Faiz and we all agreed to it by acclamation. Mir Saheb persuaded Faiz Saheb to accept our nomination request. We informed our Chinese hosts and our Ambassador in Peking. Faiz Ahmed Faiz had the halo of renown and respect in the Communist world, which at that time spanned half the Globe. Throughout the period of our travels in China Mir Khalil ur Rahman Saheb showed deference and friendship to Faiz Saheb, giving him anti-cold medicines when we traveled in a brand new Chinese Express train from Peking to Shanghai. In post-prandial sessions in the luxury train's restaurant, Faiz Saheb delighted us with his latest poems on China, and received special compliments from Mir Saheb. A good, practising Muslim, I still recall the enthusiasm Mir Khalil-ur-Rahman showed in the preparations for going to the Grand Mosque in Urumchi in Sinkiang for ceremonial prayers on Friday. Through an interpreter, Mir Saheb spoke to the Imam and gave the greetings of the people of Pakistan to our brethren in Sinkiang. On our return to Pakistan we urged our government, with success, to allow PIA to operate a Sino-Pakistan passenger air service across the Karakorum mountain range. We communicated this suggestion from the people of Sinkiang to President Iskander Mirza of Pakistan. The PIA and the Government of Pakistan soon made this airlink a reality and it is now one of PIA's popular air routes for going to China and the Far East. During our travels in China, I was personally a witness to Mir Khalil-ur-Rahman's concern for the well-being of his friends and associates. 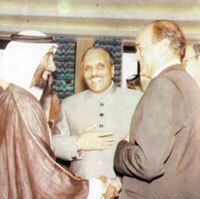 One of the members of the Pakistan Editors' delegation was Zahoor Hussain Choudhry from East Pakistan. While flying across the Gobi desert in the sizzling summer heat, our aircraft, which was a refurbished World War II transport plane, had to make an emergency landing at Chinese Air Force Base in the heart of the Gobi desert. The personnel in charge of the Airbase hurriedly made arrangements to host us for a day or two until the arrival of the relief plane from Peking in the next 24 hours. We were warned that the radiation of heat in the Gobi desert is incredibly rapid and steep so much so that by midnight one could experience wintry night temperatures. Our Chinese hosts had provided in each room of the hostel heavy woollen blankets. As night approached the mercury fell sharply and by midnight it was like a cold wintry night in Islamabad. Mr Chowdhry felt very cold and mentioned it to Mir Saheb. Kind and considerate to the core. He rushed upstairs to his room and brought his blanket and gave it to Mr Chowdhry - our Bengali colleague, much to his delight and relief. When we arrived in Canton, our first port of call in China, I had some difficulty in explaining to the hotel staff that a cup of steaming green tea did not fit into my concept of the stimulating ritual of early morning Lipton tea with milk and sugar. Mir Saheb sensed the nature of my problem and discovered the solution in a short while and said to me: "Please ask the maid to get you "HongCha" or Brown tea" with milk (niunai) and sugar (tang). Mir Saheb's masterly recipe was a boon for me and all through the four weeks we travelled in China I clung to it tenaciously and the hotel maid obliged me with my cup of tea. Mir Saheb had a wonderful sense of humour. 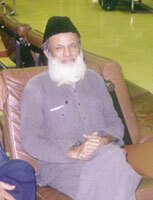 He treated such situations with ingenuity and the investigative quality of a good journalist digging sources and facts for a good readable story most of which he shared with his readers in his dispatches from China to the largely circulating Urdu daily Jang in Karachi and its editions in other parts of the country. An efficient reporter to the hilt, he literally burnt the midnight oil to do his copious reportage from China for his group of newspapers in Pakistan. Until then no Pakistani journalist had done such detailed reportage from China. Mir Saheb was indeed one of the builders of Sino-Pakistan friendship. Advertising revenue is indeed the monetary sinew for the survival and growth of a good newspaper enjoying nation-wide circulation. Perhaps on other newspaper publisher is the early years of Pakistan realised and practiced this axiom with such dynamic efficiency as did Mir Khalil-ur-Rahman Saheb in building up the Jang Group of Newspapers into a financially stable an progressive newspaper chain. He considered wasting the hard-earned funds of his newspapers on personal luxury a sin. He was always keen to learn more about the printing advances and new print machinery in the foreign countries he visited, got their details and if feasible he lost no time in importing the new machinery or news transmission equipment for his newspaper chain in Pakistan. He ploughed back the profits of his newspapers into developing them technologically or for raising the salaries and benefits of his staff. I remember that he and I were together in New York in 1997 as members of Prime Minister Junejo's entourage, when Mir Saheb and I visited the Press Section of the United Nations and got temporary Admit cards made to enter the press area and the UN restaurant. A few days earlier the Pakistan Government had appointed me the Chairman of the Government-managed National Press Trust Group of 14 daily newspapers. Before I took over charge, my predecessor had placed orders in the USA for the import of latest high speed Goss Rotary printing machines. It was in my knowledge that the United Nations in New York was operating four Goss rotary machines. It was in my knowledge that the United Nations in New York was operating four Goss rotary machines and that the New York Times was also using a cluster of Goss Rotary machines in its press and print establishment. Egged on by Mir Khalil-ur-Rahman Saheb, he and I visited these giant rotary machines in the UN printing establishment and in the NYT press in New York. We saw them in operation and Mir Saheb penned in his fat notebook the vast information we gathered then about these unique rotary machines. I gave one of the two Goss Rotary machines we imported for the NPT newspaper Group to the Pakistan Times in Islamabad and the other to the Pakistan times in Lahore and its Urdu twin, the Imroze. A few years later, Mir Saheb imported the Goss Rotary for his newspaper Jang Group. During our travels in China, Mir Saheb was always keen to visit the local daily newspapers, especially their editorial desks and their printing presses. He made friends with their editors and senior staffers. The Karachi University has a fairly active department of journalism, awarding M A in Journalism degrees. It will be most apt if it now consider instituting PhD in Journalism and selects students engaged in doing research on the life and achievements of the pioneers of the Pakistani press such as Mir Khalil-ur-Rahman Saheb, Mr Hamid Nizami, creator of the Nawai Waqt Group of Lahore and Maulana Akram Khan of the Azad Bengali daily of Decca, Faiz Ahmed Faiz the first Editor of the Pakistan Times of Lahore, Maulana Zafar Ali Khan of the Daily Zamindar of Lahore, Altaf Hussain, Dawn's celebrated Editor. Arshad Sabri whose eminent father served the Jang in Delhi and Karachi deserves kudos for running the Mir Khalil-ur-Rahman Memorial Society. All these great luminaries of Muslim journalism are fit subjects for PhD in journalism theses. Their excellent pioneering works in the field of Muslim journalism can be sources of inspiration to budding journalists and future newspaper builders in Pakistan. What needs to be highlighted in the suggested theses on such subjects for PhD courses is the tenacity of will and determination these pioneers of Muslim journalism showed in facing tyrannical officials, monetary difficulties, wiles of unprincipled rivals, sudden slump in advertising revenue and fearless reporting of factual news and protecting the source of news as sacred duty in journalism. Mir Khalil-ur-Rahman's journalistic achievements constitute an epic and a fascinating success story in the history of the Pakistani press. The Council of Pakistan Newspaper Editors (CPNE) should have a permanent website, accessible in any part of the world to give detailed of the Pakistani and their history and achievements. Having been a member of the CPNE for many years I am aware of the immense services of Mir Khalil-ur-Rahman Saheb and his newspapers rendered to its growth and consolidation as an active and strong Union of Pakistani Editors. In point of fact, the inception and consolidation of the CPNE can be a fit subject for a PhD in journalism thesis at the Karachi University. The University Grants Commission should consider giving special grants to the Universities PhD in journalism, some affluent newspapers may be inclined to help. Veteran citizens, senior judges, well known politicians, educationists and people belonging to different fields of life have been continuously recognising the services of Mir Khalil-ur-Rahman in Pakistan movement and his efforts to make the Land of the Pure a strong country. Former minister of state for housing and construction Makhdoom Javed Hashmi said Mir Khalil-ur-Rahman was a faithful lieutenant of Father of the Nation -- Quaid-i-Azam Mohammad Ali Jinnah and he loved and served the poor people. He introduced modern journalism in Pakistan and widened the coverage of his newspapers by publishing sports, literature, showbiz and interviews of the different sections of politicians and experts on national issues. Javed Hashmi said Mir Khalil-ur-Rahman through his Urdu and English newspapers and magazines taught and encouraged three generations of people for half a century. He said that founder Editor-in-Chief of Jang group was pioneer in introducing and translating English features and publishing latest pictures. Veteran Educationist and former Chairman of the University Grants Commission, Professor Pareshan Khattak said that Pakistan Movement remained weak till there was no active Urdu press in the sub-continent. Mir Khalil-ur-Rahman was among the pioneers who introduced Urdu newspapers in 1940s. Prof Pareshan Khattak said according to the record of India Office Library the Commissioner of Delhi had declared that Mir Khalil-ur-Rahman was a rebel and for his active services for Pakistan movement Mir Sahib was sent to prison in the then British capital. He said Mir Sahib taught Pakistanis in motherland as well as settled abroad. Internationally recognised human rights activist and founder of the Edhi Foundation Maulana Abdul Sattar Edhi said that Mir Khalil-ur-Rahman encouraged him tremendously and recommended his name for the international awards from the United States, Philippines and several other countries. He said Mir Khalil-ur-Rahman published his newspapers with a purpose. Former chief Justice of Lahore High Court Mian Mehboob Ahmad said Mir Khalil-ur-Rahman's life is a source of education, not only for journalists but also for people belonging to other fields. He made a solid contribution for the creation of Pakistan as well as strengthening the country of the Muslims. Justice Mian Mehboob Ahmad said that through his Urdu and English newspapers Mir Khalil-ur-Rahman taught the lesson of love and piece. He also struggled against the elements who create hatred among various classes. 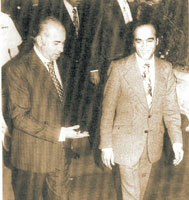 Mir Khalil-ur-Rahman strived and supported the struggle for the independence of judiciary and rule of law. He used to advice reporters to present the facts and refrain from sensationalisation. He suggested that Mir Saheb's contribution in different fields should be recognised by holding seminars in schools, colleges, universities and press clubs in different cities and towns throughout the country. Former mayor of Karachi Hakeem Mohammad Ahsan said Mir Khalil-ur-Rahman served courageously and without prejudice. He made it a policy that point of view of every citizen should be published in his newspapers. He said that because of its policy Jang became more popular than other newspapers as well as its circulation increased tremendously. Hakeem Mohammad Ahsan said that in personal life Mir Khalil-ur-Rahman was a very humble man, simple and good mannered. He used to respect elders and love the youngsters. This proves that he was a great man who served humanity. Veteran leader of the Awami National Party (ANP) Ajmal Khattak said that he feels an honour for him to speak about the contribution and services of one of the greatest personalities of Pakistan like Mir Khalil-ur-Rahman. He said Mir Khalil-ur-Rahman believed in integrity and unity of the all sections of population throughout Pakistan. Justice (retired) Qadeeruddin Ahmad said he knew Mir Khalil-ur-Rahman since he (Justice Qadeer) was President of Delhi Muslim League. He said that there were only two newspapers which used to fully support All India Muslim League, Daily Jang was one of them and other was Anjam. But Jang used to support more courageously than Anjam because Mir Sahib practically supported Pakistan movement. Justice Qadeeruddin said Daily Jang used to give sufficient publicity to the meetings, proposals and other activities of the Muslim League. He said that not only in Delhi but Mir sahib continued his practical coordination after independence and creation of Pakistan on August 14, 1947, when he shifted the publication of Jang to Karachi, the first capital of Pakistan. Justice Qadeeruddin said that from the newspapers of Jang group people learn that what is in the national interest since Mir sahib throughout his life strived for national interest. Veteran Jurist said that he found Mir Khalil-ur-Rahman a good friend. 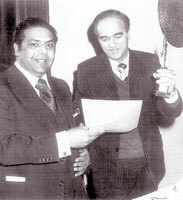 Mir Khalil-ur-Rahman and Qazi Abdul Majeed Abid were given Writers' Forum Award in 1985. 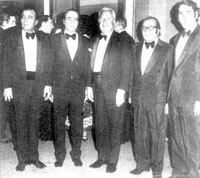 Photo taken on the occasion shows (L/R): Hakeem Mohammad Said, Chairman Award Committee, Writers' Forum, Gul Mohammad Warsi, Qazi Abdul Majeed Abid, Mir Khalil-ur-Rahman, Dr Jamil Jalibi, Mohammad Usman, Tahir A Khan, Chairman Interflow Communication, Haleem Qureshi, Chairman Writers Forum, Rais Amrohvi and Irshad Hussain Kazmi. Engrossed in work -- MKR in his office. MKR with former Chairman Senate Waseem Sajjad. A memorable picture with Mufti-e-Azam of Palestine. Mir Saheb saying his prayers at Masjid-e-Nabavi. The delegation of editors of Pakistan who were going to participate in the General Assembly of International Press Institute in Berlin, just before departure. 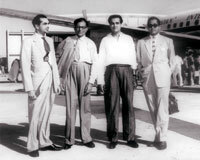 From L/R Ajmal Hussain (Illustrated Weekly), Mir Khalil-ur-Rahman (Jang), H M Abbas (Comment) and Fakhar Matri (Millat). Ever the unassuming charity and care giver, Mir Saheb always found time and money for disadvantaged individuals. Addressing the APNS Awards function held at Karachi, in February 1989. 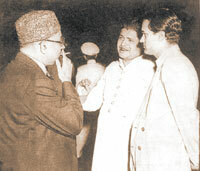 Mir Sahib with Liaquat Ali Khan. With senior judges of the Supreme Court, the then chief justice Nasim Hassan Shah and Justice (retd) Rafiq Tarar. 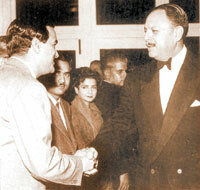 In a formal function Khawaja Nazimuddin, the Governor General of Pakistan, having a word with the newsmen. British Prime Minister Edward Heath with Pakistani journalists. 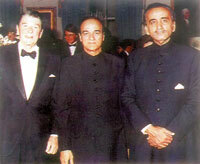 Mir Saheb with Mohammad Khan Junejo and Ronald Reagan (ex-president USA) on the occasion of the former's visit to the United States of America. Begum Mumtaz Rashdi, who wrote this article for MKR's death anniversary special report of January 25, 1998. Death has kept a decent distance from revealing some features of Mir Khalil-ur-Rahman's humane and worldly characteristics. Yearly observances of his death anniversaries have gradually taken the shape of a symbol of great success in Pakistan of the giant Jang Group of Newspapers of a media magnate of the international repute and significance for both Urdu and English readership. The personality of Mir Saheb, which I knew, somehow seems less real, lost in the grandeur of high profile anniversaries. As an individual he was firm in pursuit of his profession, calculated in approach and never a spendthrift. He was very 'desi' with a relaxed way of lifestyle. His handsome, good-looking demeanour, however, set off his western dress with panache. A fine writer, even a workaholic. Yet, each day - he came out as the soft-spoken considerate friend, a husband who gave immense respect to his wife, who had concern to only for his vast business interests but the future of his own children. I remember the days during 1970s when Zulfiqar Ali Bhutto was the prime minister. His firebrand editor of Daily News Wajid Shamsul Hassan wrote editorials that picked out the dangers in Bhutto's style of governance in various, long-term damaging ways. Daily News, and even Jang did not flinch. Mir Saheb, at the same time, being an old friend and associate of my late husband, Pir Ali Mohammad Rashdi, would come to our house every day, to narrate the different aspect of information Ministry - Dabado' as he called it. Late Naseem Ahmed was secretary, while late Maulana Kausar Niazi was the federal minister for information at that time. He was very worried; veiled threats of nationalisation of the Jang Group of Newspapers were being conveyed to him. He was too much of a gentleman and personable to emphasis on his personal fame in our land, to Bhutto, and the ultimate power of the pen. He was buffer for Wajid Shamsul Hassan, never interfering with his right and position of an editor who spoke his mind. In his inimical way, he tried to keep Bhutto's anger at bay. Naseem Ahmed's and the Maulana's nervous concern was soothed with soft apologies: "How can I gag an independent press" as you call it' an editor with a mind of own? What of my own credibility? I have been publishing Jang against the heavy odds since before independence in Delhi. I have built it up as I have faith in my editors and respect for the opinions and significance of the columnists who write for my papers. Independence of press is important to me. Of course, I sympathise and apologise(verbally) for the problems you face but I will not gag my editor and writers. Mir Saheb managed to keep up his way - and have it too! Until, nationalisation of Jang become a close threat; in fact, too close. Mir Sahib spent hours with Rashdi almost every day at our home in Islamabad. Except for the scepter of nemesis for the free press, it was a treat to listen to them. Sometimes there were fine memories of the early days - (1949-52 to be exact) after independence. When Muslims where being massacred in India, as if, in a war of attrition, particularly in Indian East Punjab, Prime Minister Liaquat Ali Khan and Minister for Information and Broadcasting Khawaja Shahabuddin decided first to send a delegation of eminent editors of Pakistan, to talk to Nehru, also to be eminent Indian politicians, Patel and President Rajendra Prasad (what later known as 'Liaquat-Nehru' pact of 1951), to stop the genocide and perhaps pave the way for peace. Rashdi then President of APNEC led the delegation with Mir Khalil-ur-Rahman, Mazhar Yusuf and some other well-known journalists. They were able to convince the protagonist of violence in Amritsar and Delhi and had extensive meetings with Indian President Rajendra Prasad, Prime Mister Jawaharlal Nehru and of course, Patel, with his team. 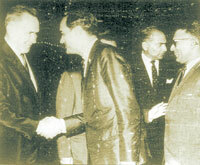 Shortly after, Prime Minister Liaquat All Khan with his team was in Delhi and signed the 'Liaquat-Nehru pact'. Subsequently, an Indo-Pakistan Joint Press Committee was formed in the beginning of 1951, which constantly kept in touch to exchange news, view and see that there was a free flow of newspapers from either side of the border. Mir Saheb was a close associate of Rashdi and of Altaf Hussain who was editor of Dawn at that time. The remarkable aspect of Mir Saheb's visits was the sparks and flashes of humour. Mir Saheb was not a boisterous man. Nor did he reveal any cutting edge of satire. Yet, all was there, quiet, soft even dramatic. In his diction; his conversational style, telling in impact. While Rashdi was still out one evening, he narrated to me how flustered Maulana Kausar Niazi was after Rashdi's visit to his house where they had sat and talked about he consequence of the Prime Minister 's desire to nationalise Jang. "Maulana should think twice during the evening, in the cool of his garden." Mir Saheb opined. "As I entered," said Mir Saheb, "Maulana Saheb was meticulously picking up burnt out matchsticks strewn all over the lawn around one particular chair. 'Rashdi Saheb was here. You know he smokes a pipe.' Mir Saheb practically acted out Maulana Saheb picking up matchsticks to clean up his impeccable grass lawn. "But" said Mir Saheb "Maulana knows how to relax from the tension of Rashdi Saheb's visit. It was a physical exercise." However, somehow Jang was saved from the nationalisation. In the mid of Ayub Khan's regime, Mir Sahib and Rashdi thought out new frontiers for Jang and launched the London edition. During the same year, Javed was growing up. He used to come to our house in Garden West to work with Rashdi planning and finally publishing the popular weekly 'Akhbar-e-Jehan. During 1986, in a TV programme, produced by Nizamuddin of PTV, Khushbakht Shujaat did a remarkable 50-minute interview with Rashdi. Mir Khalil-ur-Rahman was one of the four, amongst Hashim Raza, Ali Ahmed Brohi and Sharif al-Mujahid who were interviewed about their opinion on the four careers of Rashdi - as a journalist, minister (Both provincial and central), litterateur - writer and his role in the Pakistan Movement from the landmark 1938 Sindh Muslim League Conference in Karachi. Rashdi in turn, offered Khushbakht extra mileage by telling her of his special relationship with Mir Khalil-ur-Rahman. He said: "Mir Saheb was wholly responsible for my birth in 1964 as a Urdu columnist - where I feel, I am more popular with my readers all over the Urdu reading world. I myself did not realise that when Mir Saheb, who also visited me in the Philippines, China and in Hong Kong, could see in me the dormant columnist in Urdu. He has the accomplishment of recognising hidden talent and knowledge of bringing it out for the readers. He has the art; he recruits people of outstanding merit who may have an ego in writing. Nevertheless, they bask and grown in the freedom Mir Saheb gives to their thoughts and then offers it as a gift to his nation. He is personal friend too. I have always favoured huge, American cars of my own for transport. Whenever I needed him for some consultation I also went in a rickshaw to meet him - such is the urgency with which his friendship calls." Begum Mumtaz Rashdi the wife of Pir Ali Mohammad Rashdi, a renowned political figure in Pakistan, was the family friend of Mir saheb. At the last leg of 2004, she breathed her last and left a deep void in the hearts and minds of her friends and relatives. Her friends will remember her due to her love and hospitality which she used to display generously whenever anyone used to come to meet her. I still remember when I went to interview her, almost two years back, for sharing her memories about Mir Khalil-ur-Rahman she had lot to say about him, because she was a witness to so many occasions, where Mir Sahib had participated and she had joined him along with her husband at that time. The interview lasted for about an hour, but it comprised so many details about one event or the other. The Pakistan movement and Mir Saheb's association with it, always had some interconnection. Even at the end of the interview she was not satisfied since she wanted to share some more thoughts and details with me and I promised her to come some times later to take another detailed interview. She always showed her interest in The News special report which is taken out on the death anniversary of MKR every year on Jan 25. She would call me on such occasions and would give me her precious advice about the supplement. Almost two months before her death, I discussed the topic with her and lined up another interview in the coming month. But alas! As it happens with all the journalists, once they enter the office, the pages dummies, production deadlines, production schedules, official meetings, workplans, interview schedules, all become so hectic that hardly, we find time to just fulfill those promises, which we had made some time ago. During the whole year, I planned many times to go to her and each time it was some "urgent" supplement which kept me busy, until the day I heard that Begum Mumtaz Rashdi has left this mortal world. May Allah Almighty rest her soul in eternal peace. Following is an excerpt from her previous interview which she gave in 2003 in connection with the MKR's death anniversary report. "I knew Mir saheb since my younger age, but the actual acquaintance developed after my wedding with Ali Mohammad Rashdi, who was Mir saheb's friend. Mir saheb was a tall and handsome person with very polite mannerism. In 1952, Mir saheb went with a press delegation to India, the purpose of which was to pave the way for Liaquat-Nehru Pact. At that time a lot of riots had erupted there resulting in mass killings of Muslims. That delegation played a very positive role in cooling the temper of the two sides." While describing the sense of humour in Mir's life, she said: "Bhutto's era was an important one in the history of Pakistan. 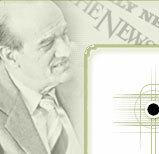 Wajid Shamsul Hassan was the editor of the Daily News at that time. Since Mir saheb had given full liberty to his editors, so Wajid used to write very critical editorials about PPP government. Notwithstanding, Maulana Kausar Niazi had suggested to take Jang under a Trust. Mir saheb was quite worried and came to Islamabad to meet Kausar Niazi, who was residing in a big bungalow having a large green lawn. While returning, he came to our residence. I received Mir saheb and asked him as to where he was coming from. He said: "I am coming from the bungalow of Maulana Kausar Niazi. I was asking Maulana that what he was doing with Jang, but he kept on picking matchsticks from his lawn." While saying all this Mir saheb also acted it out to me. He would bow down and imitate Maulana Niazi picking something, while saying "Pir saheb aaye hoay thay" (Pir Sahib had come here). On seeing confusion on my face, Mir saheb explained to me that Pir saheb has just come from Maulana's residence and since he (Pir Sahib) smoked pipe, so he lit a lot of matchsticks there. Maulana Niazi could not bear these matchsticks on his beautiful lawn so he was picking all of them. While adding Mir saheb said: "I was talking on such a serious matter, and he was concerned about his lawn. It shows how these ministers take serious matter so lightly." This is one of the incidents, which shows Mir saheb's wit. Mir saheb was never pressurised by the government or compromised on the quality. 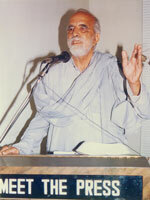 Jamiluddin Aali, prominent poet and columnist, says: "Mir saheb possessed a unique personality. He was hardworking, intelligent and a God-fearing human being. He was bestowed with a broad vision. I knew him since he was in Delhi. We spent a lot of time together. When his office was on Burns Road, once I went to take him since we were going somewhere together. It was the first day of that month. I reached there at the given time, but Mir Sahib was not there. Instead he had left a message for me that he would be late for 4-5 minutes. I asked as to where he had gone, but nobody knew about it. A new employee, however, told me that he had gone to the next street. The narrow street was an abandoned place, so out of curiously, I went there to see him. I saw some 70-80 children and women were standing in a queue there and Athar Nafees, the famous poet who was working as cashier in Jang at that time, was standing with Mir Sahib with cash in his hand. Mir Sahib was distributing cash among those people. As he caught the sight of me, he just went mad and asked annoyingly as to why I had come there. He asked me to go back on the pretext, 'may be you recognise some of them' and I really resignised some of them. While back to office he insisted on telling the name of the person who disclosed his whereabouts to me and I informed him about the person. Mir Sahib scolded that person bitterly. On my intervention, he cooled down. Then he took oath from me to never reveal his secret. I told him that if I remained alive after him then I would tell this event to others though I would not reveal the names of the people. As a journalist, he set new trends in journalism. He took column writing to new heights. He printed humourous and super serious columns in his paper besides making a place for literary and informative columns. During tours abroad, I found him an accommodating person. Mir saheb was a true friend. When I resigned from the Press Trust, he asked me to sit in Jang and Daily News, but added: "In my personal opinion, a friend should not do the job of a friend. But I will make projects with you." I expressed my desire to open a unit to manufacture typewriters in Pakistan to which he agreed to invest in the project. Though I did not use his capital but he helped me in taking loans from the bank. Then I suggested that I want to have something like Time Magazine under Jang's umbrella. Again he agreed and I made the feasibility plan and kept the name "Akhbar-i-Jahan" for his weekly magazine. During Gen Zia's rule, there was strict pre-publication censorship in the country. Mir saheb never took the risk of frontal confrontation with Marshal Law. Nobody took it. However, Mir saheb adopted the policy of procrastinating things. Mir saheb had the qualities of a shrewd administrator. He never followed the policy of any government. He always shielded his staff from the govt's wrath. During 1977, he refused to side with the government. He said: "My newspaper is a public servant. It's not my property anymore, we are just doing management. I cannot interfere in its affairs." Mir saheb was a visionary man and expanded his empire in a balanced manner. He also wanted to publish Jang from New York and Los Angeles. While observing 13th Death Anniversary of Mir Khalil-ur-Rahman, the pioneer of modern journalism in Pakistan and founder of Jang Group of Newspapers, it would be appropriate to pay tribute to Mir Saheb's efforts in various fields for more than fifty years between 1940-1990. Mir Khalil-ur-Rahman established Urdu Daily Jang during the Second World War (1939-1945) in early forties in Delhi, the then capital of undivided India. The resolution for the establishment of Pakistan was passed in Lahore by All India Muslim League headed by the Quaid-i-Azam Mohammad Ali Jinnah on March 23, 1940. From the very beginning Jang was among the few newspapers which made solid contribution in the Pakistan movement. After the independence from the British yoke on August 14, 1947, Mir Khalil-ur-Rahman shifted Jang's publication to Karachi, which remained first capital of Pakistan for twelve years till 1959. Apart from giving extensive coverage to different activities of politicians and successive rulers in new Muslim country, Mir Khalil-ur-Rahman was desirous of educating and encouraging the students in writing and poetry, hence a students' page was regularly published in Daily Jang. Veteran journalist, celebrated poet and internationally recognised writer Shafi Aqeel joined Daily Jang in May 1950. In a meeting Shafi Aqeel who served Jang group of Newspapers in various capacities for more than four and a half decades told this scribe about Mir Khalil-ur-Rahman's interest and actions in patronising the youngsters. From the very beginning Shafi Aqeel was made in charge of Jang's students' page "Bhai Jan". Jang's student's page "Bhai Jan" used to be published on every Sunday. Since then for about a decade Urdu newspapers were published in lithography and the pictures through blocks were published on the back page of the weekly issue. In order to encourage the upcoming writers "Bazmey Nau Aamoze Musannafeen" was established and Afsar Aazar was made its President and Naseem Durrani (who later on became the editor of monthly Seep) its Secretary. Through Mir Saheb's patronage Shafi Aqeel used to hold weekly meetings of "Bazm" on every Sunday at Anjuman Taraqqi Urdu Library situated at Pakistan Chowk. Celebrated poet and writer of National Anthem Hafeez Jalandhri, Director General of Radio Pakistan Z.A. 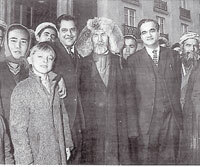 Bukhari, senior columnists Majeed Lahori, Shaukat Thanvi and Ibney Insha and well known poets Mahirul Qadri, Sirajuddin Zafar, Mehshar Badayuni, Adeeb Saharanpuri, Tabish Dahelvi, Athar Nafees, Karrar Noori, Sehba Akhtar and Akhtar Ansari Akbar Abadi used to speak and recite in these meetings, while the reports of these Bazam meetings used to be published in the students' page of Jang regularly. Shafi Aqeel said that since it was not possible to publish the writings of hundreds of upcoming writers in students' section of the Jang a monthly "Bhai Jan's" publication started in early 1951. Some of the writers and poets who started their career in students' page of Daily Jang and Monthly "Bhai Jan" have made useful contributions in Radio, television and newspapers. 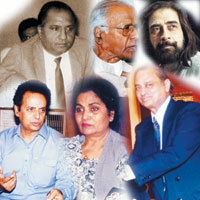 They include Hasina Moin, Ubaidullah Aleem, Mohsin Bhopali, Rasheeda Rizvi, Mustansar Hussain Tarar, Athar Shah Khan, Naseem Durrani, Afsar Azar, Naeem Aarvi, Ali Zafar Jaffri, Abdul Qayyum Shaad, Ghazi Salahuddin, Anwar Shaoor, Qamar Ali Abbasi, Raza Ali Aabdi, Khalida Shafi, Ifta Gul Aejaz, Naushaba Siddiqui, Mohammad Umar Memon, Rashida Zafar, Nasreen Habib, Firoza Jafar, Anwar Ahsan Siddiqui, Yunus Sharrar, Ghulam Mohiuddin Zafar, Fazal Ilahi Bhahar, Sami Anwar, Rizwan Siddiqui, Shaiqul Khairi, Athar Roomani, Yunus Hamdam, Ajmal Aijaz, Ateequllah Shaikh and Qadeer Ghausi. The greatest personality of Urdu language Baba-e-Urdu Maulvi Abdul Haq in his letter on January 14, 1951, said that he was delighted to see monthly Bhai Jan. He said that there were very few newspapers and magazines for children. Some newspapers write about children's likings and dislikings. He said that Bhai Jan was giving good things for material children and also publishing beautiful pictures. Such articles encourage the children to read newspapers through the services of your magazine "Bhai Jan" they will learn to write good and clean Urdu. "This is a great service for which I congratulate you and Mir Khalil-ur-Rahman", he commented. On April 2, 1952, Maulana Abdul Majeed Salik wrote that there were very few magazines for children in Pakistan while in an independent country it is necessary to publish good magazines for children. I have been looking at monthly "Bhai Jan" for several months and I am happy that it is doing a lot to publish useful articles and pictures for children which can give them good lesson. I congratulate the founder Mir saheb and workers of this magazine who are engaged in the national service. I am hopeful that this magazine will succeed in its mission and every child in Pakistan will benefit from it. Maulana Chiragh Hasan Hasrat also wrote a letter to Mir sahib and editor Shafi Aqeel for the publication of children's magazine. In 1961, Mir Khalil-ur-Rahman had the honour to start publication of daily Jang on offset press and change its size from 20"x30" to Jahazi size 23"x36". Till 1992, Mir saheb continued to increase the publication of new newspapers and magazines from different cities of Pakistan and also from London the capital of the United Kingdom. His contribution in five decades was unparallel.